I hope all my readers enjoy a safe and happy New Year's Eve and that 2009 ushers in a great year for you. I felt that 2008 was a good year, despite some tough economic issues, and I look forward hopefully to what 2009 will bring. I am sure there will be plenty of great times ahead, although the financial situation remains tough. But we will find a way to persevere and make it a good year. What can you expect from The Passionate Foodie in 2009? Here are some things, though not the only ones, you can expect. First, I will continue to write plenty of posts about wine and food, more reviews, news, and articles. I will continue to see out wines from every corner of the world, expanding my wine horizons. I'll keep seeking new restaurants to dine at and report back my experiences. I hope that my writing continues to improve and that my readers enjoy what they find here. I have no plans to slow my pace in 2009. Second, I will continue to post about Saké, including more reviews, as well as possibly some advanced educational items, building on what I presented last year during Saké month. I may even expand some of the prior Saké posts, to add additional information. Third, I will continue to delve more into Portuguese wines, and may even travel to Portugal in the fall of 2009. If so, maybe I will get to visit Ryan and Gabriella of Catavino again. Fourth, I will be traveling to Las Vegas again in April and will attend the UNLVino Wine Tasting as well as dining at some excellent restaurants. I will likely also visit New York City again, hoping to try some new places there. As for other trips, I am considering a few others, such as to the wineries of Long Island, and will provide more information when those plans become more concrete. Fifth, I would like to see, and will work toward, more cooperation and community among the Boston area food bloggers. Local wine bloggers are already moving in that direction and it would be great if the local food bloggers did the same. I am sure we can all help each other in various ways, making each of us better. Lastly, I hope to provide a few exciting surprises in the coming year. If you have any suggestions, feel free to email me. Cheers and dine and drink with passion! While perusing the shelves at the Lower Falls Wine Co., I found this wine. It was from a region of Spain, Ribeira Sacra, from which I had never had a wine, so I decided to buy it. I wanted to continue to expand my wine horizons, to try something new. The Ribeira Sacra is a D.O. located in Galicia, much of the vineyards planted in steep valleys and gorges of the Rivers Miño and Sil. It has an ancient history of wine making, some of its wines said to have been transported to ancient Rome. Yet it is currently a small wine region, largely unknown in the U.S. as so few wines are exported to here. Decanter magazine (11/08) had an article about this region, noting it as an up and coming area. The D. Ventura winery is small, about three hectares, and family-owned. Their farming is organic, though not certified as such. They only use indigenous yeast and none of their wines are filtered or cold stabilized. The 2006 D. Ventura Vina Caneiro ($27) is made from 100% Mencia, from vines that are over 80 years old. It was fermented in stainless steel and saw no oak. It has an alcohol content of 14% and only 500 cases were produced. The 2006 vintage was said to be "stunning." As this wine is made from Mencia, it will bring to mind the wines of the Bierzo region, also in Galicia and which are more readily available in the U.S. The Mencia grape is usually very fruity when young, as well as having mineral notes. The older it gets, it becomes more elegant and complex. This wine had a dark red color, nearly opaque, with a powerful nose of raspberry and black cherry. Those strong berries flavors are prominent on its taste along with mineral notes and moderate tannins. It feels like more of a serious wine, not just a fruity, easy-drinking wine. The finish is long and satisfying, and the wine presents a good structure and some complexity. Because of it tannins, I would recommend drinking this wine with food. It would pair well with some pork or even steak tips. This is an interesting expression of Mencia and I would recommend you check it out and expand your own wine horizons. It is now time for the final post of my review of 2008. Part 3 concentrate on my wine and alcohol favorites of the past year. This is certainly not a complete list. It is more a sampling of memorable matters I have experienced and posted about over the past year. Favorite Store for Saké: Only open for a year, Sakaya in New York City is an exceptional store that sells almost only Saké, as well as some Shochu and Plum Wine. The owners, Rick and Hiroko, are both personable and very knowledgeable about Saké. They have a great selection of Saké and I have not been disappointed anything I have bought there yet. Favorite Italian Wine Store: Also in New York City, Italian Wine Merchants is the place for excellent and hard to find Italian wines. It is a beautiful store where proper wine storage is a cornerstone of their service. They have many interesting classes and their newsletter are very informative. Favorite New Local Wine Store: Bin Ends, a discount wine store in Braintree, is a must visit for any wine lover. With some of the best wine prices around, their diverse selection and knowledgeable staff, make this a worthwhile trip. They also created Twitter Taste Live, which I previously mentioned as one of the significant wine events of the past year. In these rough economic times, this is the type of store that you should patronize. Runner Up for Favorite New Local Wine Store: Salem Wine Imports, a boutique wine store in Salem, deserves recognition. It has an excellent selection of wine and Eric, the owner, knows plenty about wine and is personable and friendly. Favorite Existing Local Wine Store That Is New To Me: Though it has been around for two years, I first visited Wine Sense, a boutique wine store in Andover, this past summer. With a vibrant and passionate owner, Samanta, this store is small but has an intriguing selection of wines. If you want to try wines that are less common, but excellent, then stop by this place. Favorite Wine Dinner: The Rabbit Ravioli was one of the highlights of the special wine maker dinner at Il Capriccio in Waltham. Christoph Künzli, the wine maker of Le Piane, was present and helped explain the wines that paired with each delicious course. It was an amazing dinner with several amazing wines. Favorite Winery I Visited: While touring Long Island, I visited Paumanok Vineyards and it thoroughly impressed me. I tasted numerous delicious wines, including my favorites, their 2007 Paumanok Chenin Blanc and 2005 Petit Verdot Apollo Drive Vineyard Limited Edition. These wines were as good as any wine made elsewhere in the U.S., and definitely show the potential of Long Island wines. Favorite Wine Magazine: WineS Magazine, first published in October 2007, concentrates on education about wine rather than wine reviews. For those new to wine, or anyone seeking to learn more about wine, this magazine would be extremely beneficial. It is easy to read and understand, and contains many of interesting articles and features. It fulfills a niche that no other wine magazine really addresses. Runner Up for Favorite Wine Magazine: Decanter, a British wine magazine, has impressed me lately due to its extensive coverage of many less common wine regions, often ignored or marginalized in other wine publications. Plus it has an excellent wine cartoon in every issue. Favorite Wine Fact: One of my favorite grapes is Pinotage and I finally learned the correct way to pronounce it. I had been pronouncing it incorrectly for years so it was fascinating to learn my error. And it is an error committed by many others too. Favorite Wine Biography: The Widow Clicquot was a compelling biography and history book about woman who left an indelible stamp on the history of champagne. It is easy to read and you will speed through each chapter, savoring the anecdotes and facts about an impressive woman. Favorite Alcohol Book: If you want a fascinating and comprehensive look at the history of wine, beer and spirits, then you must read Drink, A Cultural History of Alcohol. This thick book covers alcohol from all over the world, from ancient times to modern. I learned so much from this book, as would any reader. I highly recommend this book. Favorite Tequila, High-End: For Tequila costing over $100, the Don Julio 1942 Tequila was superb! Super smooth, lots of interesting flavor, and in a cool looking, agave-shaped bottle. I enjoy this tequila better than some others tequilas that cost even more. Favorite Tequila, Regular: For regular Tequila, including Blancos to Anejos, my favorite new brand is Partida Tequila. Smooth, flavorful and complex, these tequilas are as good, if not better, than the other popular labels out there, such as Patron. They can be found in Massachusetts now so check them out. Favorite Rum/Cachaca: This was an easy choice. Beija, a Brazilian cachaca or "virgin cane rum," was developed by two Boston entrepreneurs and they created an amazing spirit. With a very distinctive herbal taste, Beija is also very flexible and can be used as a base for a wide variety of cocktails. I even enjoy drinking this straight, on the rocks. Favorite Liquer: Also with an intriguing herbal taste, St. Germain is versatile liquer that is very sweet on its own but mixes well with other items. The St. Germain Cocktail makes a great summer punch and is very popular with many people I know. Favorite Vodka: A premium vodka made from rice? Yes, Kissui Vodka is a Japanese vodka made from rice and it is excellent, very smooth and clean. I can easily drink this just on the rocks. It would be a shame to hide this vodka behind any mixer. It is somethin to savor on its own, and is comparable to any other premium vodka on the market. I recently attended the Grand Holiday Wine Tasting at OurGlass Wine Co. in Saugus. A number of members of the North Shore Winers came as well so it was a fun time chatting and drinking with my fellow wine lovers. Though this grand tasting was a bit smaller than prior ones, there still were 8 wine distributors (with over 50 wines), 1 beer distributor, 1 liqueur distributor and 1 food distributors. I tasted about half of the wines and found a few stand out wines. --2006 Cellar el Masroig Sola Fred, Montsant-Spain ($10.99): A blend of 90% Carinena and 10% Garnacha. An intense fruity nose leads to a delicious wine with rich fruit flavor, a touch of earthiness and a good finish. At the price, this is a great value and highly recommended. --2007 Winkeler Jesuitengarten Riesling Spatlese Trocken, Rheingau-Germany ($22.99): A killer Riesling that tends on the drier side. Crisp, clean and lots of delicious citrus flavors. --2007 Burgaud Morgon Cote du Py, Beaujolais-France ($17.99): Forget Nouveau Beaujolais, this is an example of the true potential of Beaujolais. Dry, excellent cherry and raspberry flavors with hints of floral notes. Some complexity and a moderately long finish. --2007 Domaine de Pothiers Gamay, Cote Roannaise-France ($14.99): From a small, lesser known wine region, this wine was light and fruity, reminiscent of a good Beaujolais. --2005 Domaine Le Mas de Collines Gigondas, Rhone-Franc ($25.99): An excellent wine with restrained dark berry flavors and subtle spice tastes. Good structure, long finish and moderate tannins. A good example of how good Rhone wines can be. Let us continue our review of the best of 2008. In the first part of 2008 In Review, I discussed some of the most important events of the past year for me. Now I want to touch on some smaller events and items, including some of my favorites in certain categories. Part 2 is going to concentrate on food favorites and Part 3, which I will post tomorrow, will concentrate on wine and alcohol favorites. This is certainly not a complete list. It is more a sampling of memorable matters I have experienced and posted about over the past year. Favorite Restaurant Expansion: Midwest Grill opened a second location on Rt 1 in Saugus and this was a cause for joy. This Brazilian BBQ all-you-can eat buffet is amazing, and no one will ever leave this place not being full. It is a carnivore's heaven. Favorite Restaurant for Brunch: The Beehive's brunch impressed me with their diverse selection, delicious food and reasonable prices. Plus, it has a funky vibe with live music. Their grilled short rib and fontina sandwich is superb. Favorite Local Restaurant: Located in Medford, Bistro 5 is a fine dining destination that should be on everyone's radar. Creative cuisine, with the freshest of ingredients, should tempt any palate. A fun, quirky wine list too. Favorite Local New Restaurant: Though it has only been opened a short time, Taste of Siam in Stoneham has already garnered my attention. It has excellent Thai food, a diverse menu and very reasonable prices. A family-owned business, they have obviously devoyed much passion into this place and I wish them all the luck. Favorite Las Vegas Restaurant: Though I had several excellent meals in Vegas, the stand-out had to be Craftsteak. The Kobe Beef tasting menu was sublime, with four different Kobe beef dishes, including an amazing tartare. A great wine list, incredible scotches, and seven different desserts. Pure hedonistic pleasure from start to finish. Favorite New York Restaurant: Again, another toughie, but Le Bernardin has to take the top ranking. This seafood spectacular is very old school and has exceptional food. The sea urchin risotto just blew me away. Pricey but well worth every dollar. Favorite Dining Experience: My favorite dining experience was not at a restaurant, but rather at the chef's home. The Chefs Table dinner, hosted by Chef Peter Ungar, was an amazing experience and made me an instant fan. Five courses, six wines, twelve guests, and lots of fun and enjoyment. Favorite Desserterie: This was an easy choice as the new Le Patissier, located in the Troquet Restaurant in Boston, thoroughly impressed me. Pastry Chef Sarah Woodfine is very talented and is creating some scrumptious desserts, including some superb souffles. I think it is a hidden treasure in Boston and I can't recommend it enough. Favorite Chocolates: Another easy choice was Chocolee Chocolates, a new chocolate store in the South End. From chocolate-filled beignets to chocolate bark, owner Lee Napoli is creating some rich and amazing chocolate concoctions. My favorite are the salted caramel-filled chocolates which are so addiciting. She keeps expanding her selection so definitely stop by. Favorite Bacon Item: I am a bacon fanatic and finally got to try the Vosges Bacon Chocolate bar, which has pieces of real bacon in it. I found the combination to be delectable, as the salty bacon enhanced the flavor of the chocolate. Favorite Cookbook: Chef Tom Colicchio, who also owns Craftsteak, authored the Think Like a Chef cookbook. This book most impressed me because of its philosophy, its desire to teach people how to think like a chef rather than just learn a few recipes. It is a book that should help cooks of any level and is well written too. Favorite Food & Wine Book: Passion on the Vine by Sergio Esposito, owner of Italian Wine Merchants, was a richly descriptive book of Sergio's travels in Italy. An easy read, it is also very compelling with its descriptions of food and wine. So many fascinating anecodotes, it is highly recommended. In the United States, there are presently six Saké breweries, five located in California and one in Oregon. These US Saké breweries include Gekkeikan (Folsom, CA), Kohnan/Hakusan (Napa, CA), Ozeki Sake US (Hollister, CA), SakeOne (Forest Grove, OR), Takara Sake US (Berkeley, CA), and Yaegaki USA (Vernon, CA). SakéOne is the only US owned Saké brewery, the others all being Japanese owned. I have previously reviewed some of the SakéOne products. For more information abut this Saké brewery, I recommend you check out Tim of UrbanSake's recent interview with Dewey Weddington, VP of Marketing for the SakéOne brewery. You will learn about their products as well as their philosophy. Like 2007, this has been another interesting, busy and delicious year for me. I have dined at number of new restaurants, tasted many new wines, traveled some, and expanded my knowledge of food, wine, blogging and writing. It was an exciting time and I have many fond memories of the past year. So, as 2008 nears its end, I want to spend a little time to look back at this past year, to savor some of my best memories and achievements. I have already provided two summary lists for 2008, my Top Ten Wines Under $15 and my Top Ten Wines Over $15. Now it is time for a general summary of the past year, a rundown of several key events. These are some of the most important food and wine events of the past year for me. 1) I devoted time this past year to expanding my knowledge of wine and writing in a couple formal courses. First I took the Spanish Wine Educator's Course, an intensive three day seminar with two final exams, including a blind tasting. This course was excellent and covered an incredible amount of information about Spain and their wines. We also got to taste over 50 different Spanish wines. I am glad to say I passed my tests and was certified as a Spanish Wine Educator. 2) I also attended the first Wine Writer's Workshop held by Jonathon Alsop of the Boston Wine School. This four work course was both informative and fun. I believe I benefited from the course and I would recommend it to others as well. Another Workshop will start on January 26 so sign up now if you are interested. Jonathon is a good instructor and you will learn much from your fellow students as well. 3) One result from the Writer's Workshop was the formation of the Boston Wine Writers Group, which meets once a month and brings together local wine writers and others interested in wine. It is a great networking opportunity as well as being educational. As we enter 2009, I am sure this group will continue to grow and offer even more opportunities for all. 1) As I love Saké, it has taken a very prominent role on my blog, starting with last January's Saké Month, a month-long series of educational posts about Saké. After January, I also instituted Saké Sundays, where I try to write a post about Saké on many Sundays. Saké is growing in popularity in the U.S. so there definitely is a need and desire for more information about this incredible beverage. Just consider that there are now at least three all-Saké stores in the U.S., including True Sake in San Francisco, Sakaya in New York City and Saké Nomi in Seattle. My passion for Saké wll continue and it will remain prominent on my blog. 1) This past spring, I visited Las Vegas to attend the UNLVino Wine Tasting, a huge three-day wine tasting event. It is a larger event than the Boston Wine Expo and run much more smoothly. I reviewed many of the different wines and Saké that I tasted. While in Vegas, I also dined at several excellent restaurants, including Red Square, Valentino, Nobu, and Craftsteak. My enjoyment was further enhanced by the fact I won some money gambling too. I should be returning to ULVino in 2009, ready to taste some new wines and explore some new restaurants. 2) I also visited New York City three times this past year. One of the highlights of these trips were my visits to Sakaya , where I purchased some incredible Saké. You can read much more about my New York City exploits here. On one of my trips, I even ventured onto Long Island and visited a few wineries as well as dined at an excellent restaurant. Paumanok Vineyards was my favorite of the three wineries. I am sure I will return to New York City in 2009, and hopefully Long Island as well. 1) The Wine Blogging community has certainly seemed to be more active than the local Food Blogging Community. Though a Boston Food Bloggers group was formed, it has been relatively inactive though I would like to inject some life into it in 2009. It also seems that at most of the food events I attend, bloggers are rare, most of the other food writers being from print media. Let us hope this changes in the New Year. 2) Dr. Debs of Good Wine Under $20 founded the Wine Book Club. About every other month, the participants read the same wine-related book and post reviews and thoughts about what they have read. As an avid reader, I have thoroughly enjoyed this though the actual number of participants has generally been low. Hopefully more people will join in for 2009 and make this event grow. 3) In honor of Women's History Month this past March, I began to compile a list of women wine writers and bloggers and it has certainly has grown since then. There are now over 100 women listed there, and it continues to grow. Kudos to all of the women on this list, as well as those who will be added in the future. 4) Bin Ends began the Twitter Taste Live events, an innovative use of Twitter to promote wine tastings all across the world. There have been numerous events already and I have participated in many of them. Most of the participants are wine bloggers but others are joining in as well, the number of participants growing all the time. Prior events have included wine makers, distributors and others. There has been plenty of diversity and there are many more events planned for the future. If you are not participating yet, I urge you to join in now. 5) I have met more local wine bloggers and it has been a pleasure to share wine with them. I hope to meet even more in 2009, as well as to meet some local food bloggers. Blogging should be about community, about networking with each other, those who share a similar passion. We should not simply be people behind a computer screen but should get out there, meet face to face and connect with each other. 1) This past year, I have assisted at two wine dinners held at Melissa's Main Street Bistro in Stoneham. This includes a Spanish Tapas dinner and a South African Wine Dinner. I selected the wines for the meals and the food for the dinners were matched to the wines. During the dinner, I spoke about the wines as well as personally talking with the attendees about the food and wine. I tried to select different wines, ones that people might not be as familiar with but which were very good wines. 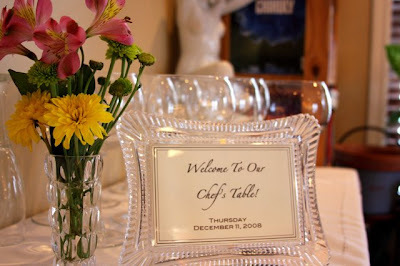 I believe both events went very well and I hope to assist at more such wine dinners in 2009. Tomorrow, I'll post Part 2, providing more specific items of note from the past year. Welcome to my second Top Ten Wine List. Yesterday, I posted my Top Ten Wines Under $15 and now it is time for my Top Ten Wines Over $15. Like the prior list, it includes wines that during the past year I have both enjoyed very much and which I found to be particularly compelling for various reasons. They might be more unique wines or just excellent values for the price. They stand out for some particular reason above the other wines I tasted this past year. Each wine on this list is linked to my more detailed prior review. The wines are not listed in any particular order and all are definitely worth your consideration. Though I have tasted some exceptional wines during the past year that cost over $50, I did not want to include them on this list. I wanted this list to be more user friendly, to provide some less expensive options that would appeal to a greater audience. Please note that the actual price of the wine may vary in your area. California, Spain and Italy dominate this list. And that echoes the basic make-up of my wine cellar, that I possess more wines from those three countries than anywhere else. I certainly drink wine from many other countries, but I drink the most amount of wine from those three regions. So, it is easy to understood the make-up of my list. There is a greater chance of finding exceptional wines when you drink a bunch more wines from one region. You can also see the variety in the list, from whites to reds, from roses to dessert wine. There is also a wide variety of grape types. It is also compelling that all three of the Italian wines I selected are from a single importer, Adonna Imports, which is certainly one of my favorite Italian wine importers. I have plenty of other recommendations for wines on my blog. There are excellent wines from countries all over the world, made from an incredibly diverse selection of grapes. Seek out wines outside of your comfort zone. Seek out the unusual. Explore the multitude of diversity in the wonderful world of wine. I am sure your search will lead to new favorites. Just a couple of items to report. First, Pignone's Cafe has ended their dinner service. With the current economy, and the long hours they have had to put in to run their restaurant from breakfast through dinner, they have decided it was not beneficial enough to continue serving dinner. This is certainly understandable considering the tough situation many restaurants currently face. Fortunately, Pignone's will continue though to serve both breakfast and lunch, seven days a week. They are one of the few local restaurants that serves breakfast, and they do an excellent job at it. Drop by for some eggs, pancakes, waffles or French toast. I also like the fact you can get breakfast for lunch as well. They serve breakfast throughout their hours of operation. Second, Georgie D's Place has now opened at its new location. I have not yet been in there but plan to visit soon. They now have a piano bar and feature various pianists on the weekend. Their food menu also looks slightly different, though mainly with the addition of new appetizers. I am sure the food quality has remained the same and I look forward to checking it out. The sharp blade silently slid through the bamboo bars and pressed against the bare flesh of my neck. The ninja held my life in his hands yet I was not fully helpless. I pushed my head back several inches until I pressed against the wall as my right hand shot up and grabbed the ninja's wrist. I then yanked hard on his wrist, bashing the ninja's head against the wall, rendering him unconscious. I had foiled the assassination attempt and looked around warily, trying to ascertain whether any other ninjas were coming to kill me. Ok, that didn't really happen that way. Everything was far more innocuous. 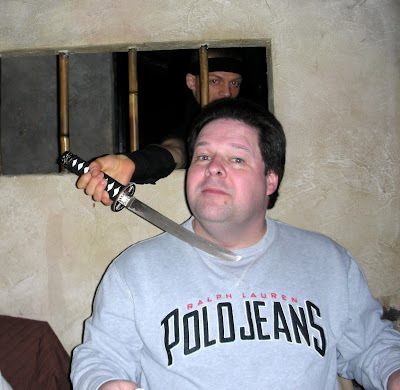 I spent time with "ninjas" but I was at the Ninja restaurant in New York City. The restaurant is part of a chain that originated in Tokyo. It is designed to resemble a medieval Japanese village and all of the servers are dressed as ninjas. Authentic? Nah. Hokey? Yes. But it actually is fun and we had a very good time. Everyone gets seated in their own little "cell" which actually is nice as it gives you plenty of privacy. It was a spacious room, as well as clean. 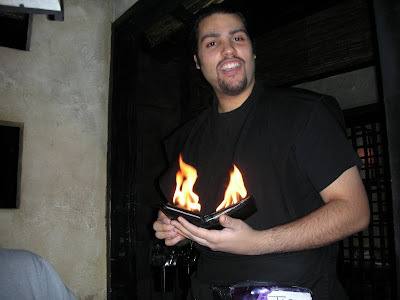 Our server was a female ninja, garbed all in black, and first presented us with drink menus, unrolling scrolls for us. They have a complete drink menu, including wine, beer, sake, mixed drinks and nonalcoholic ones. The Retsu ($12) is an intriguing sweet martini made from banana puree, Godiva white chocolate, Creme de CoCo, Hazelnut liqueur and topped with a dark chocolate mousse sauce. Much more of a dessert cocktail. The Kai cocktail ($12) is created from muddled blackberry with dry sake, vodka, mango juice, and Chambord. An excellent drink which was not too sweet. I chose to start with the Hanzo Sake Tasting ($20) which gave me samples of four different Sakes, including a Junmai, Junmai Ginjo, Junmai Daiginjo, and Tokubetsu Junmai. The Hanzo brand is made exclusively for the restaurant. I generally enjoyed the Sakes, though they mostly tended on the sweeter side. The food menu also came as a scroll and you can either select a multi-course meal or order a la carte. The multi-course dinners range from $50-$90 and all include five courses, one dinner being a vegetarian offering. The a la carte menu includes sushi/sashimi ($3-$8 per piece), sushi rolls ($12-$13), hot and cold appetizers ($10-$25), and entrees ($22-$43). The nigiri/sashimi menu is very limited, with only eight varieties available. We began with some tuna ($4), fatty tuna ($8), and eel ($4). They do not usually sell tamago, sweet egg omelette, but they use shredded tamago in one of their dishes so they specially prepared for us a tamago roll ($3). It was shredded tamago wrapped in nori and was a nice accomodation. The sushi is expensive but was tasty, fresh and good-sized. It is not the best sushi in the city but it is not disappointing either. We also ordered the Teriyaki Roll ($12), grilled beef wrapped in red leaf lettuce with teriyaki sauce and surrounded by rice. It too was tasty, with decently tender beef, albeit pricey. For entrees, we had the Caesar Salad ($12) which came in a sizeable bamboo bowl topped by a large and delicious oven baked Parmesan Cheese crisp and some bread. My nephew devoured the large salad, reveling in its taste. The rest of us shared a few dishes, including the Red Pond ($35), fried Chilean Sea Bass in a bloody spicy pond of sauce; Ribeye Steak ($43), a 22oz Ribeye served with Garlic, Wasabi and Teriyaki Sauce and mixed Vegetable tossed with Sesame Sauce; and the Bonfire ($40), grilled marinated lamb chops served with a torch. They did a fire trick with the Bonfire dish which was cool to watch. All of the dishes were very good, large and with tender and flavorful cuts of meat. I think they were a bit pricey but the quality was there. 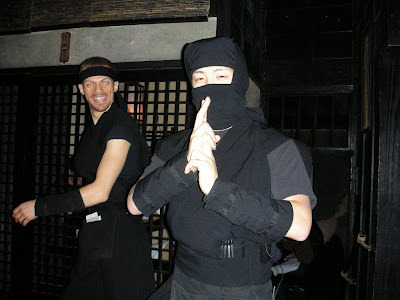 During the course of our evening, ninja would suddenly pop up, sometimes brandishing their swords from around a corner or through the window as in the first picture in this post. A bit of theater meant to enhance your enjoyment. Plus, the presentation of many of the food dishes involved fire or other culinary tricks. This may not appeal to everyone but if you look at it light-heartedly, you will have a fun time. My nephew loved the restaurant and the rest of us enjoyed it too. I had booked my reservations through Open Table, noting that we would be celebrating my wife's birthday. The restaurant paid heed to my note and brought out the above dessert tray to her, with a rose in dry ice and a candle in a strawberry. I am always glad when a restaurant pays attention to the comments made in the Open Table reservation. Not all of them do so and it does reflect negatively on them. Sometimes it is the little touches that can really make or break a positive experience. After our dessert, a magician stopped by our table to do some intriguing close-up magic. It involved mainly cup and ball tricks, such as figuring out which cup had the ball, or how many it might have. But he was quite skilled and I could not discern how he performed any of his tricks. He was also a very good performer, with a snappy and personable patter. His final trick involving lemons appearing under the cups was excellent. It was an excellent cap to the evening. Service was very good and entertaining. 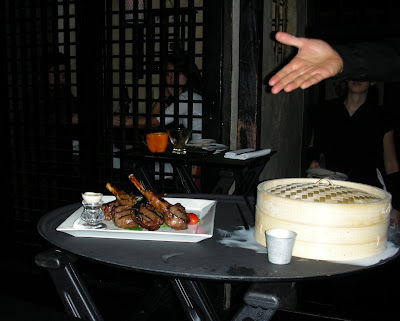 Overall, the food was tasty and good quality though pricey, which I suppose is part of the cost for the entertainment. I think children are going to love this place and even parents will have some fun. The restaurant is far better than some negative reviews I have read, and I think it is worthy of checking out. 2009 is nearly upon us so it is time for reflection upon the past year. This is a common time for much of the media to publish their lists of the best and worst of the past year, everything from books to movies, to the most powerful people to those who passed on. You will find Top Ten lists, Top 100 lists, and much more. There will be plenty of lists of the best and worst food, restaurant and wine around too, including on various blogs. Like those others, I will post some of my own Top Lists for 2008, ranging from wine to food. For my first List, please enjoy my Top Ten Wine Under $15. This list includes wines that during the past year I have both enjoyed very much and which I found to be particularly compelling for various reasons. They might be more unique wines or just excellent values for the price. They stand out for some particular reason above the other wines I tasted this past year. Each wine on this list is linked to my more detailed prior review. The wines are not listed in any particular order and all are definitely worth your consideration. Please note that the actual price of the wine may vary in your area. As I reviewed my list, I realized that three of the wines were from Portugal! That should not be much of a surprise as Portugal is still a country with plenty of excellent wine values. Their wines often are worth at least twice as much as their actual cost. I have also been drinking more Portuguese wine this past year, especially as I am still seriously considering a trip to Portugal in the fall of 2009. I also found it interesting that two of the wines on the list (#7 & #10) were tasted at Twitter Taste Live events. Twitter Taste Live continues to grow, now with multiple events every month, and has become one of the most innovative uses of Twitter over the past year. It also has showcased a number of excellent wines, including some great values. In the coming year, I expect the Twitter Taste Live events will continue to uncover some delicious and compelling wines. I have other recommendations for wines under $15 on my blog and you just have to search for them. There remain many good buys available in this price range, especially in countries like Portugal, Spain, Argentina, and Chile. Inexpensive does not have to mean one-dimensional wines that all taste the same. You can still find wines of character, though you might need to spend a little more time seeeking them out. Wine blogs can help you in that regard, pointing out wines that you might not otherwise know about. Happy Holidays to all of my readers! May the glad tidings of the season shine on you, your family and friends. May your celebrations go well and be fruitful with good people, delicious food and fine drink. May you give gifts that are well appreciated and which bring joy. May you thoroughly enjoy whatever holiday who celebrate at this season. With the holidays upon us, there may be few, if any posts, over the next few days as I prepare and celebrate Christmas. This is one of my favorite times of year. I love sharing the holidays with my family and friends, enjoying their company as we eat and drink to celebrate the season. It should be a joyous occasion, reveling in all of our blessings. Make sure you have a safe holiday as well. Please don't drink and drive, and drive safely and cautiously. We hope that everyone will remain around to celebrate the New Year as well. Drink and dine with passion! My new column of "A Passionate Foodie" can be found in the December 24 issue of the Stoneham Sun newspaper. This is a weekly column that concentrates on reviews of local restaurants though it also sometimes touches on other food and wine topics, including recipes, wine reviews and more. The new column has been published today and is available online too. The new column is a restaurant review of Bacci's of Stoneham, a new Italian restaurant in Stoneham. They serve good food at reasonable prices, and serve more than just Italian food. Join them for lunch or dinner. For the last part of this series, Chef Peter Ungár was kind enough to provide a few of his recipes, including two of the items I had at the Chef's Table. Please note that Peter does not usually use specific measurements when cooking so not all of the recipes have your usual measures. First up, the delicious Gruyère Cheese Gougères that are pictured above. Gougères are made from a basic pâte à choux with gruyère cheese, which is savory instead of sweet (such as profiteroles and eclairs). 1. Oven at 450 - line baking sheet with Silpat (or parchment paper). 2. Combine water, butter, salt, pepper, mustard, and sugar - bring to boil - add flour. 3. Stir for at least 2 minutes on medium heat - mixture forms a ball and moisture evaporates. 4. Cool mixture slightly - add eggs, one at a time - mixing vigorously. 5. Mixture should form medium peaks - then add gruyère. 6. Pipe batter into 1 oz. size balls, with 2-3" between each - sprinkled with Parmesan. 7. Bake for 7-8 minutes, or until they puff and hold their shape. 8. Mix 1 egg with splash of water - quickly brush each with fine coating. 9. Reduce oven to 350 - bake for another 20-25 minutes, or until golden brown. 10. Serve immediately - hot out of the oven. Next is the Sujeonggwa, a Korean punch, and Peter got the recipe from his mother-in-law. *Originally, this drink was sweetened with dried persimmons, instead of sugar. But quality of dried persimmons are unreliable. 1. Peel ginger, slice, slightly beat with spine of knife to release juices. 2. Put cold water in pot with sugar (or dried persimmons) and ginger and bring just to a boil. 3. Put in cinnamon sticks and refrigerate until completely chilled. 4. Finely strain within a couple hours after chilling. 5. Garnish with a few cleaned and lightly toasted pine nuts per cup. 6. Serve cold - even in winter. Lastly, Peter provided me a recipe for a holiday side dish, Sweet Potato Gratin. 1. Finely dice shallots - sweat off in clarified butter - no color. 2. Once shallots are opaque, add minced garlic - cook until raw smell has dissipated - no color. 3. Add chicken stock and finely chopped apricots - reduce to sludgy consistency. 4. Slice sweet potatoes finely (about 1/8") - rinse in cold water - pat dry on towels. 5. Barely coat the bottom of an oven-proof skillet with clarified butter. 6. Stagger potato slices, starting at the center and working outward in spiral pattern. 7. Once one layer is formed, season with salt and pepper - spread a thin layer of the apricot mixture. 8. Form another layer of potatoes - continue in this fashion until there are 4-5 layers (with potato the final, top layer). 9. Heat the pan on moderate heat - when it begins to sizzle, pour a small amount of clarified butter around the entire edge of the potatoes. 10. Continue gently shaking the pan and forming the round shape of the gratin with spoon or spatula. 11. Once it slides around the pan as a whole, place in 350 oven for about 20-25 minutes (until a cake tester or paring knife can pierce without resistance). 12. Allow to cool for 10-15 minutes and then place a like-sized plate on top the skillet and flip over. 13. Cut in pie shapes and serve. --Made hours (or a day) in advance - reheated at 400 until sizzling. --Made in a baking dish and cooked all the way in a 400 oven (covered with foil during first half of cooking - then uncovered). Are you seeking to celebrate the New Year with a fine dining experience? Then maybe you want to consider going to No.9 Park which is offering the choice of a six-course chef's tasting menu or a three-course prix fixe menu along with a Champagne toast and entertainment provided by noted radio personality Ron Della Chiesa. I love No.9 Park and I am sure you will have an excellent meal there. Seatings are available from 5:30 pm until 11:00 pm. To make reservations, call 617-742-9991. How can you get Chef Peter Ungár to prepare you such a fine dinner as the one I recently experienced? If you are not lucky enough to get invited to one of his Chef's Table events, you can hire Peter to cook for you at your home through The Dining Alternative, which he considers to be his "private dining service." Peter differentiates this from traditional catering or a personal chef. What Peter's service entails is that he comes to your kitchen and cooks an entire meal there for you. He does not prepare any of the foods beforehand, like a caterer or personal chef would. Everything is prepared fresh before your eyes. This service is generally intended to be to a special event, to have a high-end restaurant experience but within your own home for a group of your family and friends. Peter and his staff will do all of the work, from shopping to cooking, from serving to clean-up. You really have to do very little. They even have a sommelier available if you wish wine pairings. Plus, they have other extra services (such as flower arrangements and calligraphy seating cards), if desired, to enhance your event. When you initially contact Peter, you can discuss the type of dinner you would like, and he can accomodate nearly any special dietary needs or requests. Together, you design the menu of your choice. Peter can supply wine or you could even have your own wine for the dinner. If you want to use your own wines, Peter can suggest dishes to pair with those wines. 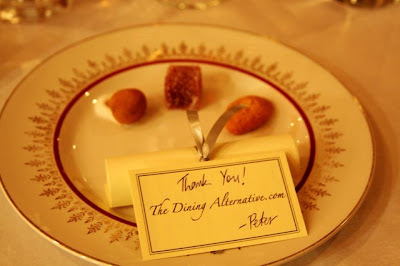 In general, Peter does multi-course dinners for 8-14 people, though he can do it for as many as 20 people. For larger groups, up to 50 people, he can prepare a hors d'oeuvre and cocktail reception. Though I have not yet retained Peter for a dinner at my own home, I can attest to the quality of the food he prepares based on my Chef's Table experience. He is a very talented chef and his food was exquisite, similar to anything you would find at a fine restaurant. I am sure this idea intrigues you but I know exactly the question you want to ask. How much does this cost? Obviously the cost will vary for each dinner dependent on the type of dinner you have, how many courses, the types of food, whether wine is included, etc. But, I can give you some idea for a comparison. I should also caveat this by stating that though the price might seem high at first, you need to examine the matter in its totality to see that it actually is very reasonably priced. To duplicate the exact dinner I ate at the Chef's Table at your own home, it would have cost about $127 per person, without wine. This is how Peter would have broken down the cost of specific courses: Scallop Sashimi $19, Lobster Tortelloni $24, Fish/Foie/Truffles $36, Pork Belly $32, Pineapple Tatin $16. The amuse bouche, intermezzo, and mignardises would have been included in the price. Though $127 per person seems expensive you must consider everything that is included in that price. You are basically hiring a team of servers and cooks to come into your home and prepare a multi-course dinner for you and your guests. Plus, consider the ingredients in the dishes I ate, from lobster to foie, from black truffles to pork belly. There are not cheap ingredients and your own dinner would not have to include so many luxury ingredients. Though Peter does always purchase the highest quality ingredients needed for the dishes he prepares. There are no other hidden or extra fees though when you receive the contract price, the actual price can vary by 10%. This is because the market price of the ingredients that Peter uses wil vary, and Peter shops just before the date for the dinner to ensure freshness. But, you have a very good idea of the cost of your meal before you agree to anything. One of the reasons why the price may be more reasonable than you initially think is the cost of wine. With the wine, you actually get a tremendous bargain that easily offsets the higher cost of the food. Peter only charges $10 per bottle above his cost, which is a wholesale price. So the wine will cost you far less than the exorbitant prices that restaurants charge. Consider a bottle of wine that wholesales for $30 and which Peter charges you $40. It would normally retail around $50 but at a restaurant, the same bottle of wine would likely cost you at least $100, if not more. So, with Peter, you would have saved at least $60 off the cost of that wine at a restaurant. And if were dining with ten people, consider if you bought five bottles of that wine in restaurant, costing you at least $500. With Peter, those same bottles of wine would only cost you $200. Now, if you had my Chef's Table five course dinner at a high-end restaurant, you would likely pay at least $75 and maybe up to a $100, dependent on the place. So while the food itself might be a bit less expensive at a restaurant, you will garner significant savings with the wine which will more than offset the increased cost of the food. In the end, the price you would pay Peter for his dining service would be less than if you dined at a high-end restaurant, yet the food quality would be at least as good, if not better. The Dining Alternative is a service that would impress your family and friends. For your next special occasion, rather than dine out, why not call Peter and dine in. I know that I will be doing so in the near future. Have you tried Chocolate By The Bald Man? That is the subtitle of Max Brenner, a restaurant specializing in chocolate. There are two locations in New York City, one in the East Village and one in Union Square. It is part of a chain created in Israel by Max Fichtman and Oded Brenner, who put their names together for the name of the restaurant and created a fictitious chocolatier, their own version of Willy Wonka. I have only eaten at their East Village spot, and then only dessert. They do serve regular food as well, such as salads, sandwiches and entrees. They also serve brunch. But it seems like dessert is what really brings in the crowds. On my latest visit, though it was only around 5pm, it seemed liked many people were foregoing dinner to just feast on dessert. We had already eaten an early dinner at Veselka so were reasy for something sweet. Luckily we did not have to wait too long for a table. The restaurant is a bit funky in its decor, going for that phantasmagorical Willy Wonka-like style. Their dessert menu is very extensive, including crepes, waffles, fondues, churros, chocolate cake, as well as novelties like chocolate pizza and warm chocolate soup. They also serve a variety of chocolate drinks from hot cocoa to martinis. Prices are fairly reasonable, all things considered. 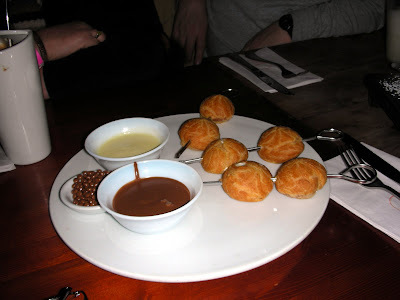 As they did not have any churros on our visit, we ordered the Vanilla Profiterole Fondue Skewers ($11.25). These aregolfball-sized profiteroles stuffed with vanilla ice cream and served on skewers. They are accompanied by a milk chocolate fondue and vanilla sauce for dipping. There is also a small dish of crunchy wafer balls. Though this is a rather simple dish, it was done well and was tasty with fresh profiterole and creamy ice cream. I very much enjoyed the Banana and Hazelnut Cream Crepe ($13.25), a thin French crepe stuffed with melted chocolate chunks, hazelnut cream, and sliced bananas. It was served with vanilla ice cream, strawberries, blueberries, chocolate sauce and candied hazelnut crunchy bits. 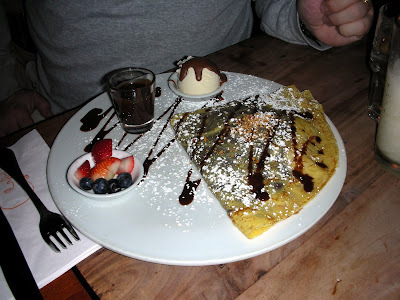 The flavors meshed well, with plenty of chocolate, and the crepe was light and warm. Again, a fairly simple dish but well executed. My nephew was enthralled with the Chocolate Syringe, which is exactly what it sounds like, a plastic syringe filled with chocolate. It was accompanied by some gummy bears. 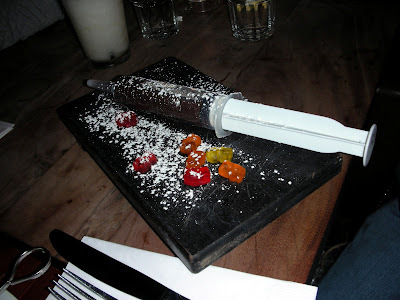 He really enjoyed the chocolate and had fun with the syringe, squeezing the chocolate into his mouth. Overall, I enjoyed the dessserts though I would not consider them exceptional. Service was a little slow, though the restaurant was quite busy when we were there. It is a place worth checking out, especially if you love chocolate. Now that the preliminaries are out of the way, now that we have finally taken our seats, it is time to begin our actual dinner. I am filled with anticipation, awaiting what culinary treasures I might soon find on my plate. As a starter, we were presented with an Amuse-Bouche, Chawan Mushi with sea urchin, white truffle oil and white flake sea salt. This is a Japanese custard that was topped with a couple large pieces of sea urchin roe. This had an interesting taste, salty and savory with a dominant fish flavor. It was very smooth with the delicious silky sea urchin. A very nice beginning to the dinner, also indicating the promise of what was to come. Interestingly, a couple days after the dinner I saw a recipe for Chawan Mushi in the January 2009 issue of Food and Wine magazine. Their recipe has different toppings though it appears you can top the custard with any variety of items. Our first actual course was Sea Scallop Sashimi in Yuzu with avocado veloute, salmon roe, pomelo, and orange oil. 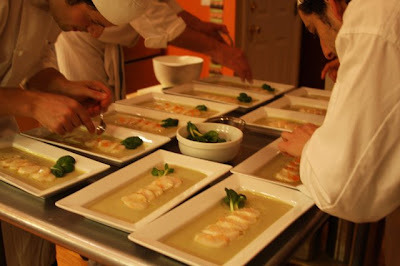 This dish had large slices of Diver Scallop and the veloute sauce was made from avocado, soft tofu and three citrus juices. The scallops were topped by pieces of pomelo, salmon roe and Hawaiian black sea salt. The tender scallops were delicious with the combined flavors of the citrus and salt though I was not as fond of the veloute, mainly because I am not a big avocado fan. But that did not matter much to my enjoyment of the scallops. The black salt was especially intriguing and I will have to seek that out. I love sashimi so this was certainly a dish that appealed to my preferences. To accompany the scallops, our second wine of the evening was the Non-Vintage Moet & Chandon Nectar Imperial. This is a blend of Chardonnay, Pinot Noir and Pinot Meunier. It was a creamier champagne than the Ruinart with a touch of residual sugar that only added a slight hint of sweetness. The dominant flavors were apple and pear and I really enjoyed this Champagne. It had lots of character and paired beautifully with the scallops. I think this is a Champagne that would appeal to a broad range of people as it is not too yeasty or dry. Yet it is not overly sweet either. Next up was one of my favorite courses of the evening, Fresh Maine Lobster Tortelloni with cepes, honshimeji, veal jus, and lobster essence. 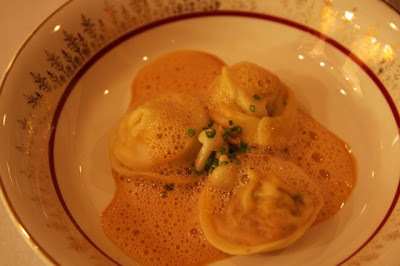 The large tortelloni were stuffed plump with lobster and cepes, a type of mushroom. Then the lobster essence was poured into the bowl with the honshimeji, another type of small mushroom. Finally, you received a shot glass of veal jus! Peter stated this was a version of surf and turf and though you might not think the veal jus would go with this dish, it actually worked perfectly, adding an intriguing meaty flavor to the dish. Everything was so flavorful and the pasta was cooked just right. I even enjoyed the different mushrooms. I am very picky about mushrooms and they must be prepared just right. Any chef that can get me to enjoy mushrooms is definitely doing something very good. The wine for this course was a 2004 Chateau Beaucastel Blanc, a fascinating white wine from the Chateauneuf-Du-Pape region of the Rhone in France. It is a blend of Viognier, Marsanne, Rousanne and a couple other grapes. It was fermented in 80% stainless steel and mostly old French oak. It had a tawny gold color with a potent, almost musty nose. Yet on the palate it exploded with flavor. It was a rich, full-bodied wine with tastes of apricot, lychi and exotic tropical fruits as well as having floral notes. A very unique wine which is supposed to pair well with pork. I thought it went well with the Tortelloni and was a fascinating wine on its own. What was next? Halibut, Hedgehog, Foie Gras & Black Truffle that was steamed in Napa cabbage and had red and golden beet glazes. 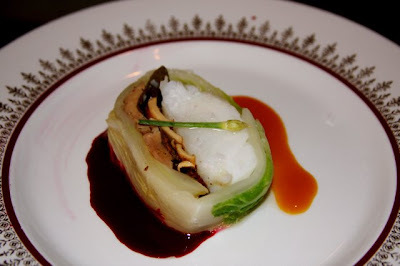 Essentially, the cabbage was wrapped around a long piece of the halibut which had been topped with the hedgehog mushrooms, foie and truffle slices. Another excellent dish with a harmonious blend of flavors and textures. the fish was pure white, tender and flaky while the foie and truffle were hedonistic delights. I even enjoyed the two different beet sauces, although I am not a fan of beets in general. Once again, this chef has gotten me to enjoy items that I usually would not like. With each course, Peter's culinary skills are impressing me more and more. The wine to accompany this course was a 2007 Meyer Fonne Gentil, an Alsatian wine that is a blend of Muscat, Gewurtztraminer, Riesling and Pinot Blanc. I did not enjoy this wine as much as the others. It had a lemony nose and that lemon flavor was dominant in its taste as well. There was some interesting underlying spice, from the Gewurtz, but the lemon flavor overshadowed the rest of the flavors to me. Others at the table though enjoyed this wine very much. It just was not a favorite of mine. It was now time for a bit of a breather and Peter had an Intermezzo for us to savor. It was Sujeonggwa, a type of Korean punch with ginger, cinnamon and pine nuts. He got the recipe from his Korean mother-in-law. It was almost like the flavor of spiced apple cider or even cold mulled wine. Yet it had its own individual taste and was a nice palate cleanser at this time. I could see this being an intriguing drink made at home if you were having a multi-course meal. On to another favorite dish of mine, the Green Cardomon Brined Kurobuta Pork Belly with lentilles du puy, jerusalem artichoke mousseline, roasted romaine hearts, and butternut miso sauce. It basically took two days of cooking and preparation to make the Pork Belly and all that time certainly paid off. It was some of the most tender and flavorufl pork I have ever had, extremely meaty and with little fat. Each piece melted in my mouth and I treasured each savory bite. I think even vegetarians would have had a hard time turning down this pork. All of the accompaniments were delicious too, even the jerusalem artichoke mousseline. Yep, artichokes are not one of my favorites but this was quite good. I also eagerly devoured the lentilles which seemed to me to have an almost bacony taste. Though I did not think this dish could get any better, it did. This was because of the wine pairing, the 2006 Domaine Tempier Bandol Rouge. I love this wine and it has long been one of my favorites. So, to have such a superb wine with the pork belly just made me ecstatic. This was foodie heaven, a perfect marriage of food and wine. This wine is 100% Mourvedre and is from what I consider the best winery in the Bandol region of France. This wine has everything going for it an it is something I highly recommend. Dessert was a Pineapple Vanilla Bean Tarte Tatin with a persimmon and mascarpone mousse, sugared tarragon tempura, and tarragon creme anglaise. Even if you felt full, this dessert was sure to tempt you into eating more. An ecelctic combination of flavors that meshed very well together. The mousse was delicious, such a creamy rich taste. And who can complain about fresh pineapple slices? Definitely not me. Even the delicate tarragon tempura was a delightful and tasty touch. Peter admitted to not being much of a baker and that his desserts usually are fruit based. If they taste as good as this, that is fine in my book. Our final wine of the evening was the amazing 1986 Pocas Colheita Tawny Port. This exemplifies the best of Port, that incredibly smooth taste with caramel, vanilla and even hints of butterscotch. It had no bitterness and such a satisfying and lengthy finish. A perfect ending to such a fantastic dinner. Yet the food had not ended. We each received a small plate of Mignardise, including a rose water pomegranate gelee, kirschwasser chocolate truffle, and amaretti crisp. These homemade treats were each quite good and I ate them all, though I was not sure I had any room left in my stomach. Our evening lasted almost five hours, and the time flew. It certainly did not feel that long, and it never does when you are enjoying yourself. This was a superb meal, as good as any that can be found at a high-end Boston restaurant. The quality, quantity and diversity of the dishes as well as the wine was exceptional, especially for only $75. You probably would be hard pressed to find any restaurant that would serve a comparable dinner with wine for that price. Many of Peter's creations had an Asian flair, which I particularly enjoy. He certainly was creative in his dishes as well as having an excellent presentation. His culinary talent was quite evident and his assistants also well knew what they were doing. Everyone else at the dinner seemed as impressed and happy as I. I also did not hear complaints from anyone, only praise and compliments for the food and wine. I would return to the Chef's Table in a heart beat and I would heartily recommend it to everyone. Tomorrow I will tell you more on how you can have Peter cook you such a delicious meal at your own home. Recently, I asked some of my Twitter buddies for a wine pairing suggestion for Waffles. I was having waffles for dinner and even ended up having Waffle Brownies for dessert. This may give me a bit of an advantage for Wine Blogging Wednesday #53. El Jefe of El Bloggo Torcido and Twisted Oak Winery is this month's host and he has chosen the theme: Wine For Breakfast. Like El Jefe, I am a big fan of breakfast and enjoy having breakfast foods for lunch or dinner. The primary objective is to pair a wine with traditional breakfast food, whatever your particular culture favors. But, there are some restrictions on the wine you can select. It must be either a dry red or white wine. Thus, you cannot choose sparkling wine, rosés, or dessert wines. Plus, you can't mix the wine with anything else. This will make the pairing a bit more challenging, though testing the wines with various breakfast foods should be quite delicious. I might also have to have more waffles. And BACON! I am sure the participants in this WBW will come with a good variety of wines, especially as breakfast can be such a diverse meal. I look forward to this very much. On or before, Wednesday, January 14, post your tasting review on your blog. More details on participating will also be forthcoming. I recently dined in someone's home and the five-course dinner was as exceptional as any fine dining restaurant in Boston. You can duplicate my experience and I strongly believe you will be thoroughly satisfied. Rather than making reservations at some high-end restaurant, you can eat at home and have the same high quality cuisine and still not have to cook or clean up after yourself. How is that possible? Over the course of several posts during the next four days, I will explain all, as well as describing some incredible food and wine. I was recently invited to attend a special Chef's Table dinner at the home of Chef Peter Ungár. Peter operates The Dining Alternative, a private dining service, and holds Chef''s Table events approximately once a month to showcase his culinary skills. I found Peter to be very pleasant, accomodating, down-to-earth, and mostly importantly, passionate. To me, it seems he cooks because he must, because he has a special drive within to excel in the culinary arts. His passion is quite evident and it is reflected in the food he prepares. The Chef's Table dinner cost $75 per person for a five-course meal with wine pairings ($60 without wine), not an unreasonable price for such. Before making my reservation, I did not know what the menu would be. It was to be a secret, partially as Peter selects only the freshest ingredients so his menu is partially determined by what is available near the time of the dinner. I certainly had no problem with that, and I was able to peruse some sample menus from prior dinners so I had a basic idea of what I might find. The mystery of it all excited me and I very much looked forward what I would find. Accompanied by my wife, we joined ten other strangers at the table above in Peter's living room/dining room/kitchen, a very spacious and homey room. This almost could have been anyone's home, with some children's toys in one spot, books shelves on another, a comfy couch, etc. Initially, we mingled with the other guests, learning who they were and why they had come. It was a diverse and fun crowd, obviously all people who savored good food and drink but also people from many different backgrounds such as a holistic health doctor and a financial advisor. I did learn that a number of other food bloggers had been invited but none of them had decided to come. I don't know their reasons but I would have thought at least a few would have been intrigued by this culinary adventure. They did miss an excellent dinner and next time, if they are invited, they should make reservations for this event. Above, you can see the kitchen staff. From left to right, you will find Quynh Dang, Antonio Lettieri, Chef Peter Ungár, and Scott Ryan. All of them were very pleasant and based on the food, quite skilled as well. The kitchen was open and near the dining table so we had a close-up view of all of the work going during the entire evening. A true insider's view of a working kitchen. 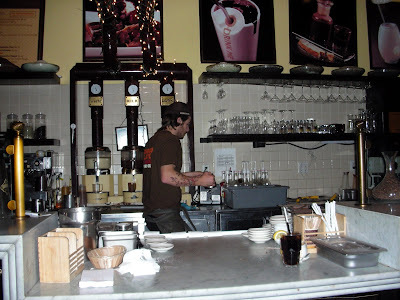 The kitchen staff had obviously worked together for some time as they operated as a well-oiled machine and I did not notice any misteps any of the times I watched them. While we stood around mingling, we sipped some Ruinart Blanc de Blanc Champagne. Founded in 1729, Ruinart is the oldest Champagne house in France. This wine is a blend of 100% Chardonnay from different vintages. It had a pale yellow color and very few and tiny bubbles. It had a nose of citrus and spring flowers and much of that came through on the palate as well. A dry champagne with a touch of yeastiness and a dominant taste of nectarine. All of the wines for the evening were specially selected to match the food by sommelier Scott Weinstein of the Martignetti Companies. He was accompanied by his colleague, Garret Vandermolen, who also talked about the wines during dinner. Both were very knowledgeable about wine and good conversationalists. To accompany the champagne, we were served some Gruyere Cheese Gougères, pictured above. These cheese puffs were so addictive! Warm, light, crispy and with that delicious taste of Gruyere I so love. These are probably so simple to make yet they hooked me, placing me in a good mood and very hopeful that the rest of the dinner would be delicious. It is like a restaurant that serves warm bread before your meal, it sets the mood so well and makes you anticipate what is to come. I think a number of restaurants miss out on the opportunity to hook their customers from the start, before their meals arrive. Drinks alone don't always set a sufficient mood. It may not seem like much, but warm bread, cheese puffs, or some similar little item can mean so much. They can be a stepping stone for the food that is to come, a welcome mat that entices the guest to enter. The same can work in reverse as well. A guest who receives ordinary, unwarmed bread may not begin the meal with a fully positive attitude. Remember, the little things can sometimes mean so much. We eventually sat down at our assigned places at the table, strangely enough with all of the women at one end of the table and the men at the other. Coincidence? Peter told me that though the seating was intentional, he had not intended to separate the men and women as it worked out. As I sipped more of the Ruinart, I pondered over what dishes I would soon be eating. Petit Robert Bistro welcomes Gourmet Magazine's European Correspondent Alexander Lobrano on Sunday, December 28 to their Kenmore Square location. Alexander Lobrano knows a thing or two about French food. Not only has he lived in Paris since 1986, winning several James Beard Awards for food writing along the way, but he’s been Gourmet’s European correspondent for the past 8 years. His latest book from Random House is Hungry for Paris: The Ultimate Guide to the City’s 102 Best Restaurants, which leads intrepid diners on a tour of the best places to eat (at any price) in Paris, while offering tips on how to maximize one’s experience at each place. It’s also a humorous memoir of becoming an ex-patriate. In Boston for one day only, Lobrano collaborated with Petit Robert Bistro's Jacky Robert on the creation of a $55 prix fixe (tax and gratuity not included) of delightful French dishes borrowed from the pages of the book. The dinner/reading/autograph session takes place at the restaurant’s Kenmore Square location (468 Commonwealth Avenue, Boston) Sunday evening, December 28 at 7:00 PM. Advance reservations required. Call 617-375-0699. Copies of “Hungry for Paris” will be for sale at 25% off the cover price, or just $12. Tax and gratuity not included in the prix fixe. I am continuing to work my way through all of the Sakés I have purchased from Sakaya in New York City. I still have a perfect streak, as none of the Saké I have bought there has yet disappointed me. And this time is no different. The Hiroki Tokubetsu Junmai ($37.99-720ml) is from the Tohoku region of the Fukushima Prefecture. It is a very new kura, Saké brewery, only having been established in 1999. As "tokubetsu" means "special," it refers in this case to the fact that this unusual Saké was made from two different rices, Yamadanishiki & Gohyakumangoku, and each was polished to a different level, 50% and 55% respectively. Each rice was used at a different step in the brewing process. The Gohyadumangoku was used to make the koji portion of the shubo, mash, and the Yamadanishiki was used as the kakemai (the portion of the rice to which the yeast, water, and koji is added to form the shubo). This is one of the first Saké I have seen made from a blend of different rice. This Saké has an alcohol content of 16-17% and a Saké Meter Value of +2, which means it tends to be balanced between sweet and dry. I shared this Saké with a group of friends while we enjoyed some Chinese food and it was a hit. I found it to have a rich nose with a touch of rice combined with some pear aromas. It was a very smooth drink, tending a bit more on the dry side, and with a delightful taste of melon and pear. It had a medium body and good acidity so it could stand up to a variety of foods. I did not eat anything spicy so the Saké seemed to go well with everything. I have to put this on my list of Recommended Saké and I think it should please those new to Saké as well. None of my friends had any complaints about it, and some of them have little experience with Saké. Would you like to win a food or wine prize, as well as feel good because you have given to a special charity? Then why not participate in the 2008 Menu For Hope! The Menu For Hope is an annual fundraising event in support of the UN World Food Program. It was started by Chez Pim about five years ago after the devastating tsunami that struck Southeast Asia. Each year, food and wine bloggers from all over the world participate in a large online raffle, offering many intriguing food and wine-related prizes. This year, the raffle runs from December 15 to December 24. Every $10 you donate gets you a virtual raffle ticket toward the prize of your choice. For every $100 donated, $85.65 will go directly to the charity. This year, the funds raised will be earmarked for the school lunch program in Lesotho, Africa. This was chosen because it is a model program in local procurement: buying food locally to support local farmers and the local economy. Instead of shipping surplus corn across the ocean, the WFP is buying directly from local subsistent farmers who practice conservation farming methods in Lesotho to feed the children there. The prizes have been quite generously donated by food and wine bloggers from all over the world and the prizes are well worth checking out. Adler over at Vinography is organizing the prizes given by the wine bloggers and you can see the list on his site. Why not take a chance and give to a good cause. Check out the prizes and I am sure there will be something that perks your interest. Though I did not win anything last year, I will be participating again this year and hope to win. Please join me and buy some rafffle tickets and help some less fortunate children.